The conflict between the American colonists and the British Parliament has come to a head at Boston. War seems inevitable. Behind the war, unseen hands move unknowing pieces, manipulating events according to ancient plans. Besides war, ghosts and monsters walk the land and ancient curses run their course. Welcome to the Thirteen Colonies. In this book you will find maps and information covering each of the Thirteen Colonies, plus the Province of Maine and local native peoples, plus a short ready-to-play adventure, A Surprise for General Cage. 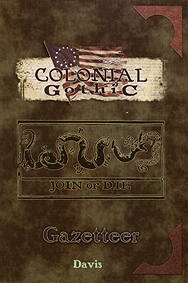 A glossary explains unfamiliar terms both native and colonial, and a bibliography points to more detailed information on the colonies and their inhabitants.